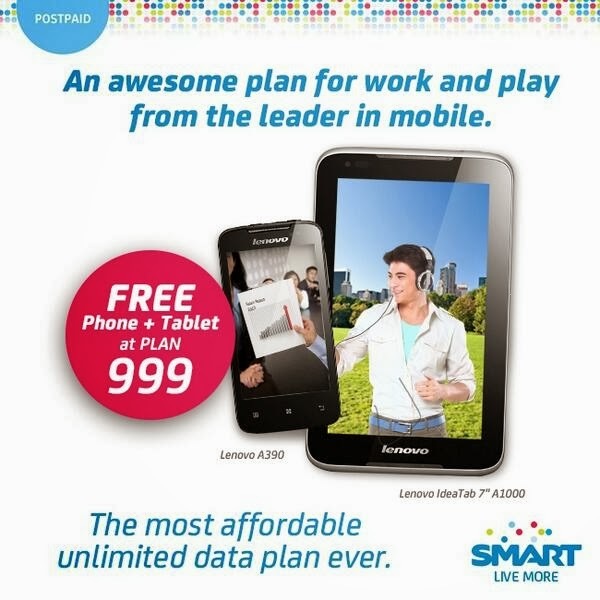 Smart seems busy offering 2 gadgets in one plan, few days ago they featured their Gadget Plus Plan series that gives you a tablet or notebook plus a Pocket Wi-Fi. In this new offer, Smart bundled unlimited data internet by default when you get Lenovo A390 Android phone and Ideatab A1000 7-inch tablet at postpaid Unli 999. You can enjoy this both gadgets without worrying of data charges plus the bundled limited calls and texts. I can say that it is worth to apply for a Unli Data Plan 999 with these bundles. This is one of the most affordable plan offers from Smart that you should look for if you’re planning to have a smartphone and a tablet without spending much for data.